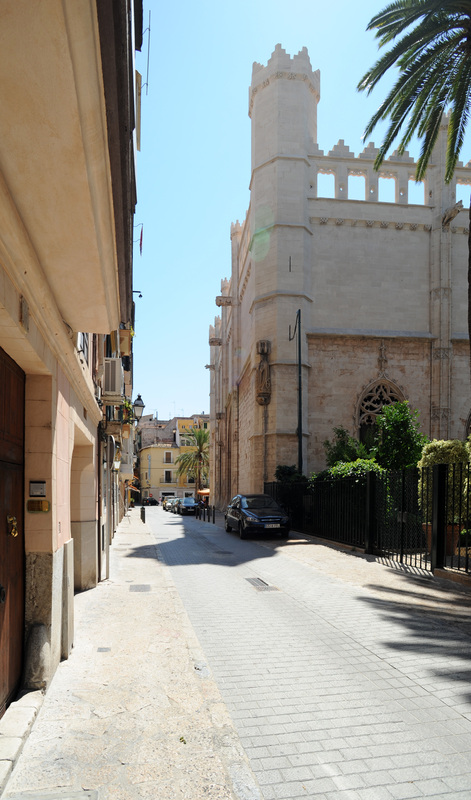 The part of the old town of Palma to the west Born is known as the "uptown". 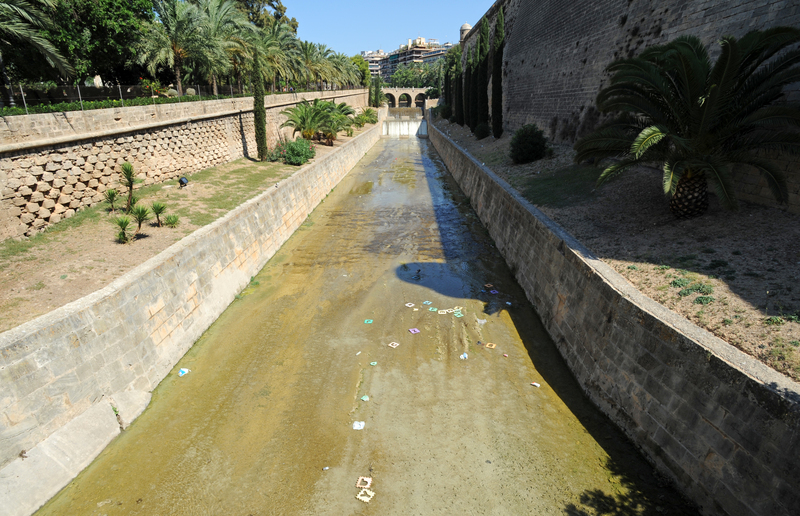 This part of the old town is between the old bed of the Riera (Torrent de sa Riera) river, now occupied by the Passeig des Born, and his new course turned off the walls of Palma in the sixteenth century because devastating floods of the river. Passeig des Born, commonly called "El Born" is a course that is to say, a wide avenue with, at its center, a walkway lined with plane trees and ideal for walking. 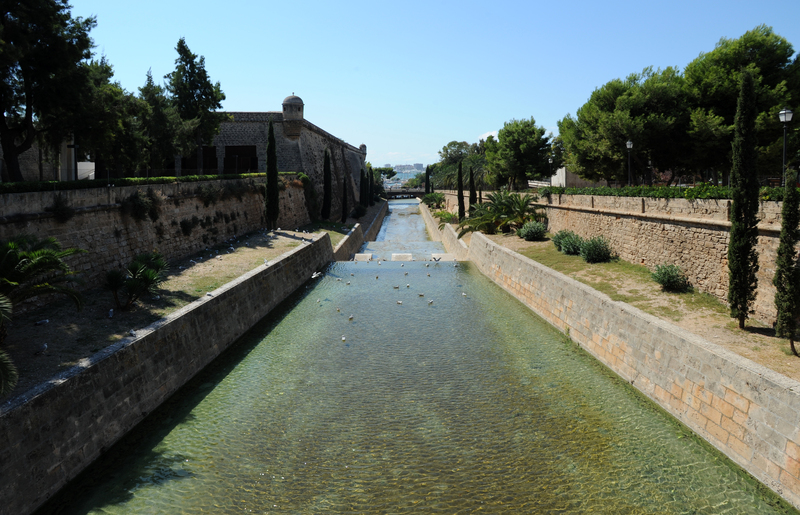 Born is the bed where Sa Riera torrent that flowed into the sea at the place where the port in Roman times flowed. After the diversion of the river, the site was used from the early seventeenth century as a place for jousting tournaments. 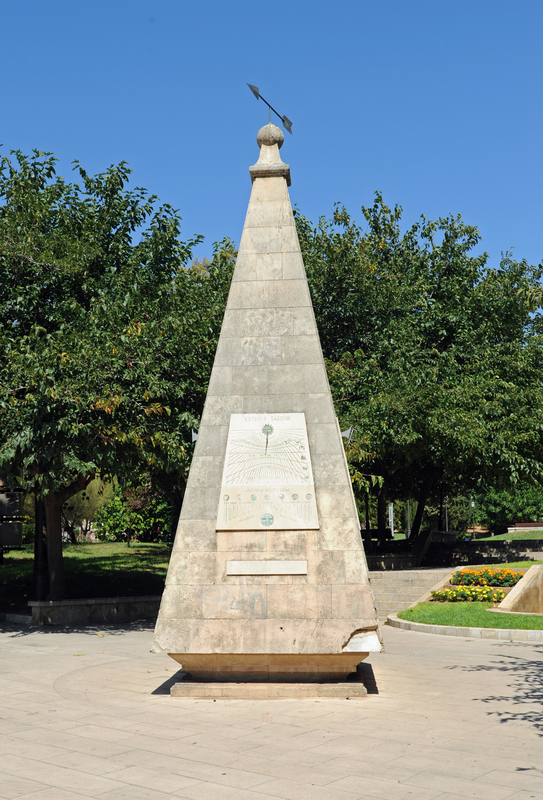 Passeig des Born is also named after the Catalan word "born" meant that the piece of wood that was placed at the end of the spear not to hurt the opponent in the games (at No. 1 of the Passeig des Born one can see a plaque commemorating this purpose). This beautiful avenue lined with beautiful patrician houses, separates the "upper town" west of the "lower city" east. Cal Marquès de Sollerich (Casal Solleric or Palau Solleric) is a baroque building from the second half of the eighteenth century, dating from 1763. 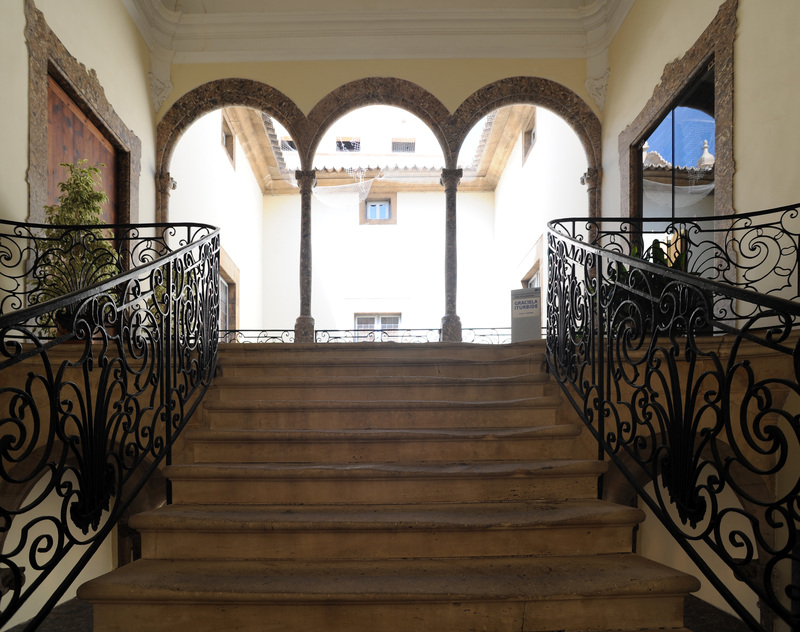 The mansion was built on the site of two old houses owned by Marc Antoni Vallès i Almadrà de Berga, a member of a wealthy family of the "mà major" (high society) and oil dealer from Alaró. His son, Miquel Bonaventura Vallès d’Almadrà i Orlandis, was appointed in 1770 Viscount of Almadrà and Marquis of Solleric. Casal Solleric is one of the few examples of a particular hotel Palma built from scratch, which is the product of a unitary concept, but the remains of a medieval fortress. Plans are assigned to Majorcan Gaspar Palmer. The decorative elements are the work of Italian sculptor Antonio Soldatti. 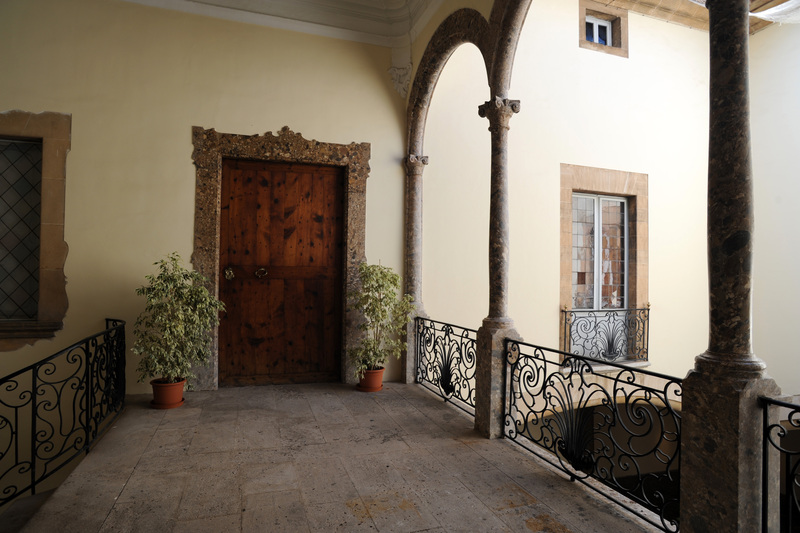 The Solleric Palace has a facade decorated with Italian sham and an elegant loggia overlooking Born. This front was actually the back of the original hotel: bypassing the building through a narrow passage, we find a typical patio mansions of Palma. 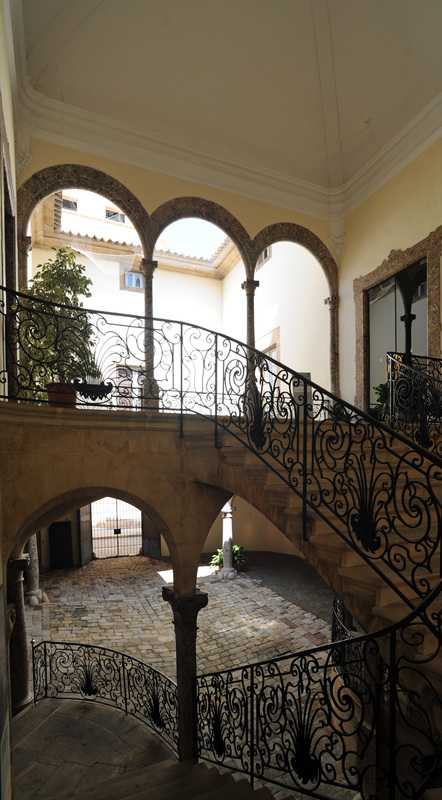 The Archduke Louis Saviour saw this patio with graceful arches as the most beautiful patio Palma. The imperial staircase double stolen, delicately highlighted with a wrought iron railing is wonderful proportions. The staircase, as the first floor is supported by very little arched vaults. 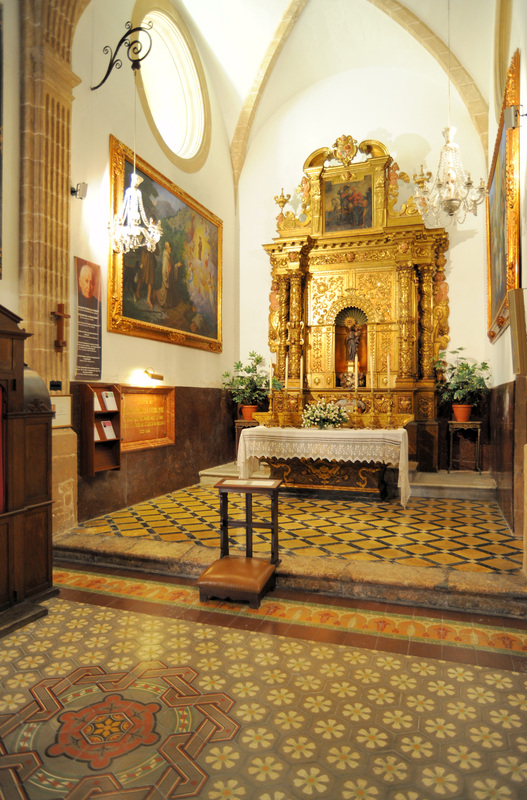 Casal Solleric is also known as Can Morell, the name of the last family who owned it before its purchase in 1975 by the Municipality of Palma, who made ​​an art instead of temporary exhibitions and contemporary culture. Hours: Tuesday to Saturday, from 10:00 to 14:00 and from 17:00 to 21:00, Sundays and holidays from 10:00 to 13:30, closed on Mondays. 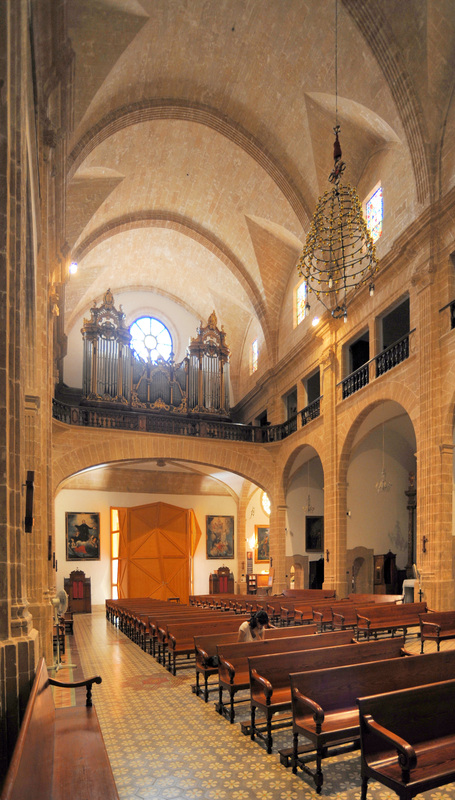 The Church of St. Cajetan is also called Church of the Sacred Hearts (Església dels Sagrats Cors / Iglesia de los Corazones Sagrados). 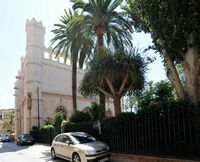 The Can Salas Menor is located at number 8 of the Carrer de Sant Feliu. 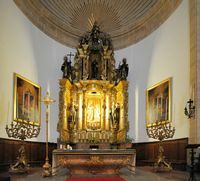 It is a home of medieval origin which undergoes changes in the sixteenth and seventeenth centuries. 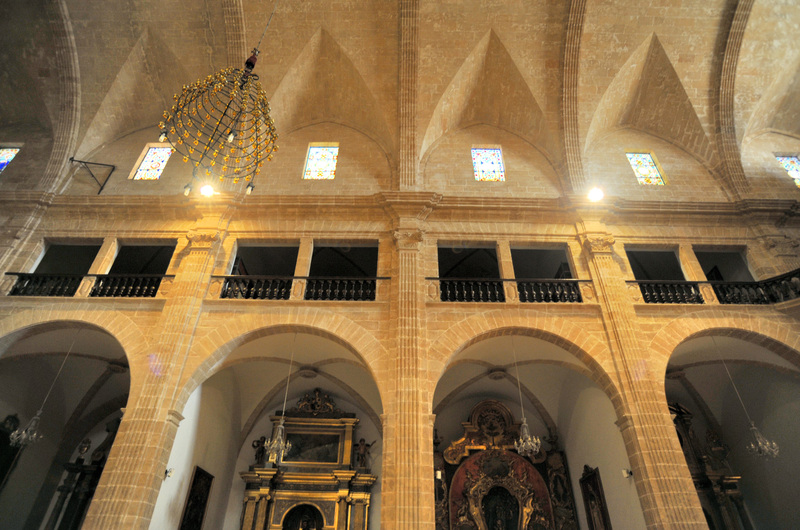 The magnificent façade was transformed following the aesthetics of the late Renaissance, between 1591 and 1602 by its new owner Jeroni de Salas Verí, who bought Miquel Joan de Sant Martí. 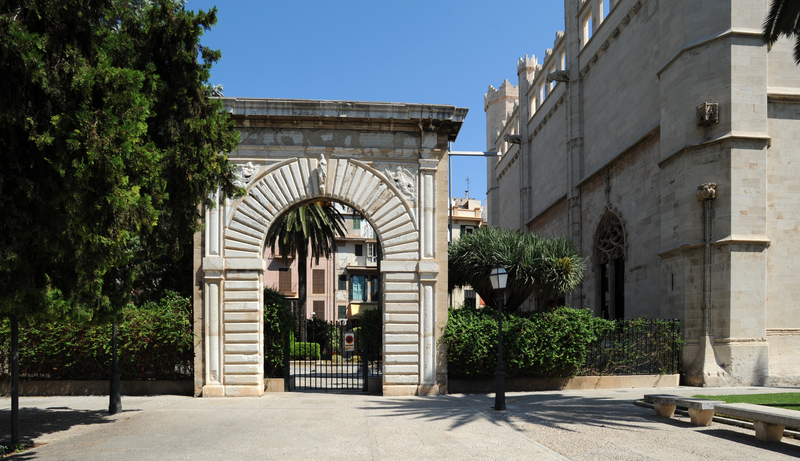 1905, Josep d’Olives Magarola bought the remains of the branch Cotoner of Palma, where he lived for more than sixty years. It was then sold to the Missionaries of the Sacred Heart. Since the input consists of two sections covered paneling gives access to the patio. There are lowered sandstone arches and capitals half-columns, with the arms of the family. The Can Belloto is at number 10 Carrer de Sant Feliu. 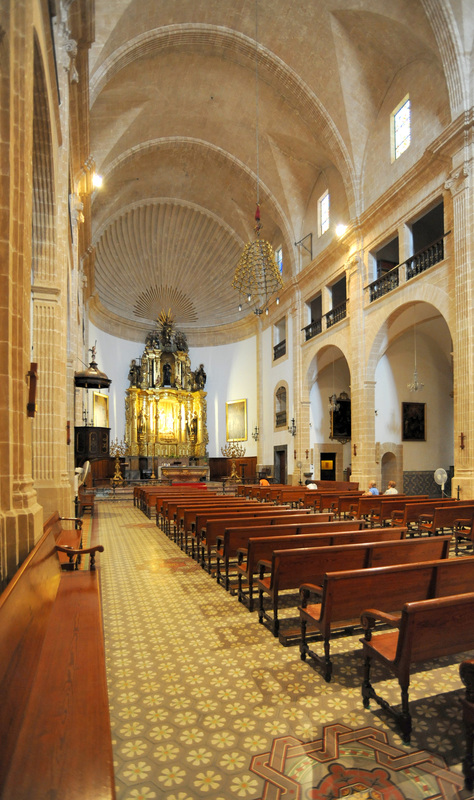 Can Belloto is the remains of a medieval origin belongs to the sixteenth century Verí family. 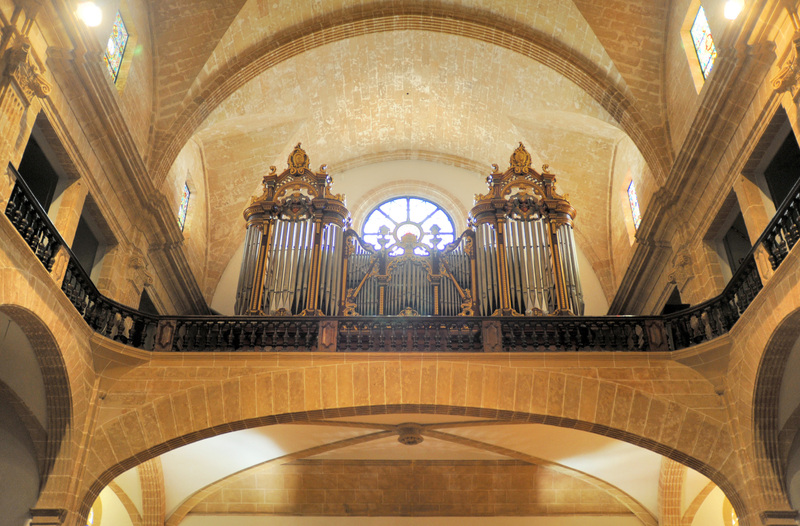 In 1584, it was owned by the merchant Antoni Mas. In 1606, it passed into the hands of the Genoese lawyer Giovanni Francesco Pavesi, who turned in a Mannerist style. Shortly after the house was acquired by Domenico Belloto, merchant who made ​​his fortune in the wheat trade. He obtained the title of military city in the year 1635 and a knighthood in 1644. The half-columns with rustic tufts of the facade, broken pediment belong to new ornamental repertoire. At the center of the pediment of the Pavesi shines the badge. 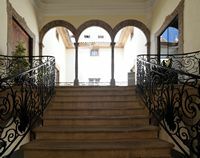 Since the wide entrance gives access to the open patio, it is there staircase with iron railing and a flattened arc in the main bearing. Cal Montenegro is at number 2 of the Carrer Montenegro. Old house with a patio largely reformed Gothic building in baroque style. The house is the result of the meeting of two buildings purchased by the family Despuig the eighteenth and nineteenth centuries. 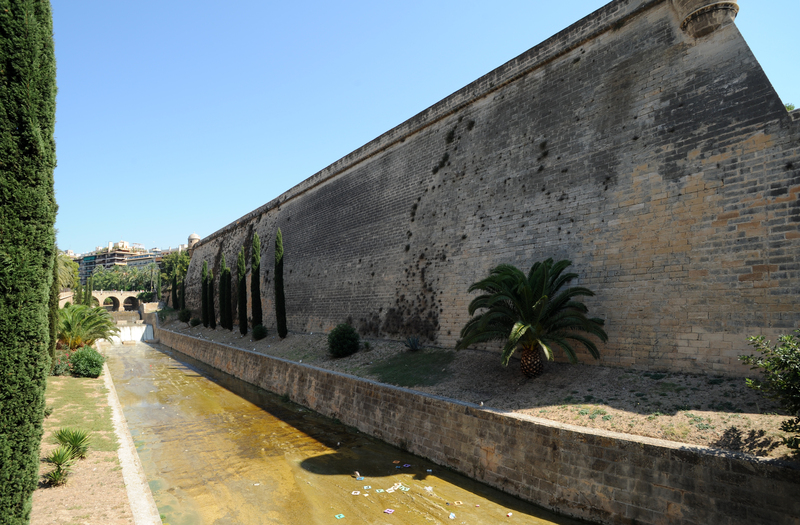 Between the two gates is a large shield with an inscription on Ramón Despuig i Martínez de Marcilla, Grand Master of the Order of Malta. 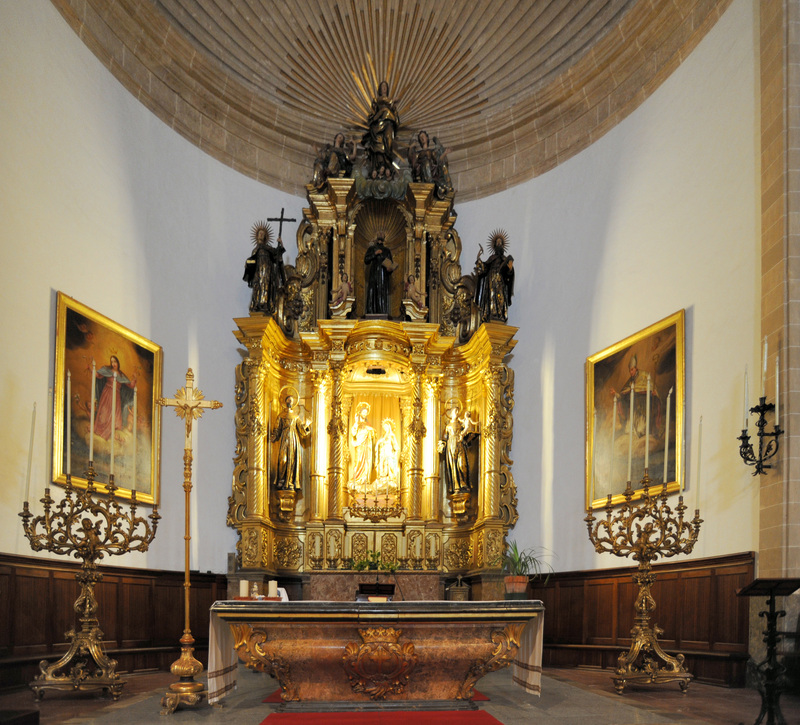 Here was born, in 1745, the future Cardinal Antoni Despuig. Baroque facade of the transformation we see with stone balconies with wrought iron balustrade that bears the crest of Despuig. The Can Cabrer is at number 6 Carrer Montenegro. The building dates from the fifteenth century, but the facade and patio are the eighteenth century. Throughout the seventeenth and eighteenth centuries, Despuig expanded their mansion named Cal Montenegro, through the acquisition of neighboring buildings, and included the Can Cabrer. The Can Cabrer has a semicircular portal and divided into two sections entrance, with a segmental arch that separates the two bodies, both of which are covered by beams. From a low arch gives access to patio, finding the stairs to the bottom, with a door lintel on the first level and a mullioned window on the right. Since 1911, the house belongs to the family Borras i Cabrer. The Can Ripoll is number 5 Carrer Montenegro. The house was the property of the seventeenth century merchant Antoni Binimelis. In the eighteenth century, it belonged to Ripoll, and in the nineteenth century, it became the property of the family of Gabriel Verd i Reure. At the entrance, we see a large bow down, and marble pilasters with Ionic capitals tradition. The side staircase railing has traditional seventeenth century. 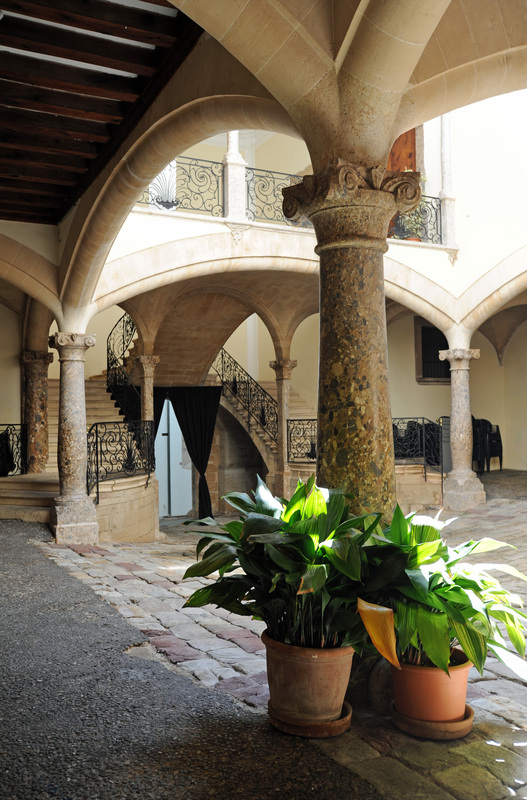 The Can Ripoll now houses the Tourist Board of the Government of the Balearic Islands. Down the Passeig des Born, Plaça de la Reina, began once the Roman port. The Can Mayol is number 3 Carrer Apuntadors. 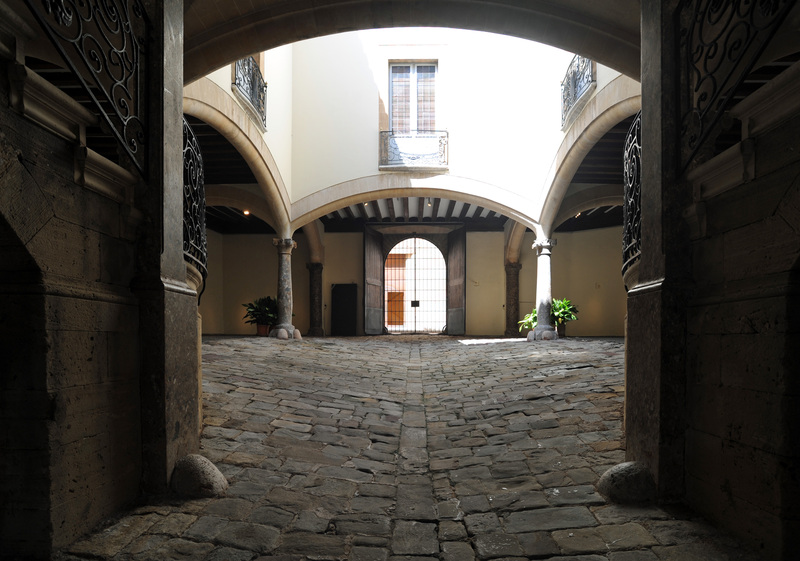 The patio forms part of the old house Can Mayol, the sixteenth century, which is inserted into a block of flats 60s. 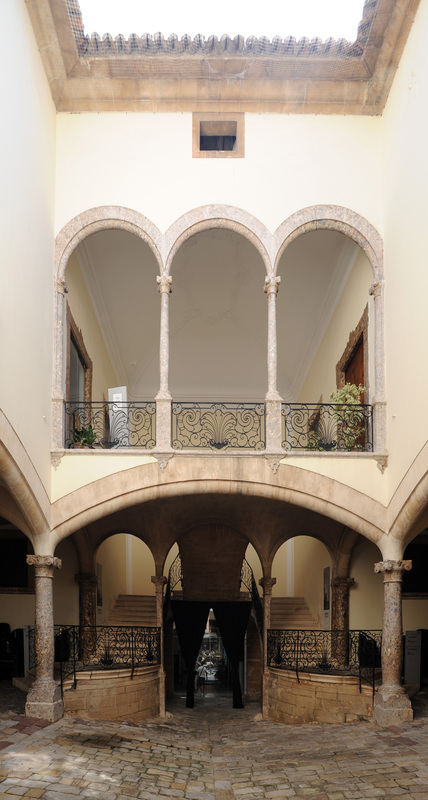 Since the large central arch down, you enter the courtyard, where still traditional architectural elements such as the arch opens to the left with half-columns and capitals of stone. 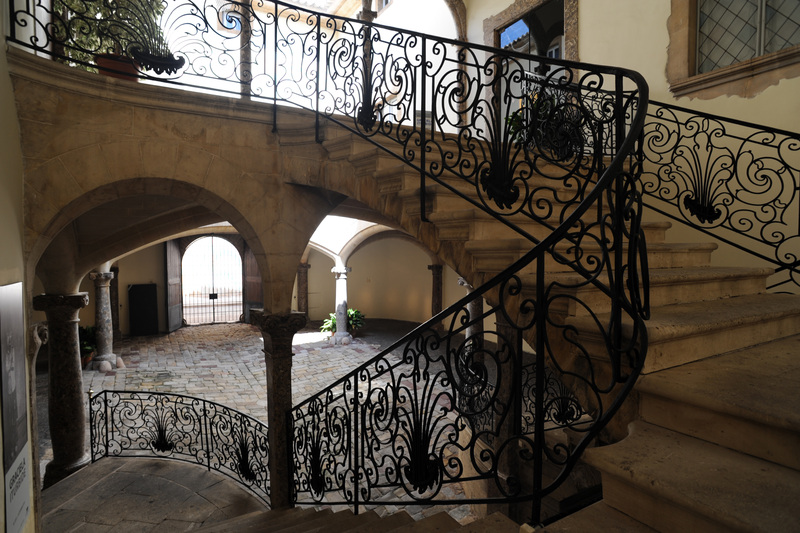 At bottom right along the lateral stairs, medieval tradition, with classic iron railing, balustrade as a sham. Access to the patio or rectangular courtyard by a passage with semicircular sandstone arches that support the upper gallery with columns and balustrade. The Can Mayol was converted into a hotel, the Hotel Tres. The Merchant Lodge was built in the fifteenth century, between 1426 and 1447 for the Merchants Association Palma, in terms of Guillem Sagrera of Felanitx, Majorcan renowned architect who also worked at Perpignan Cathedral, the construction of Sa Llotja lasted twelve years and was completed by Guillem Vilasclar by carrying the last two large windows. 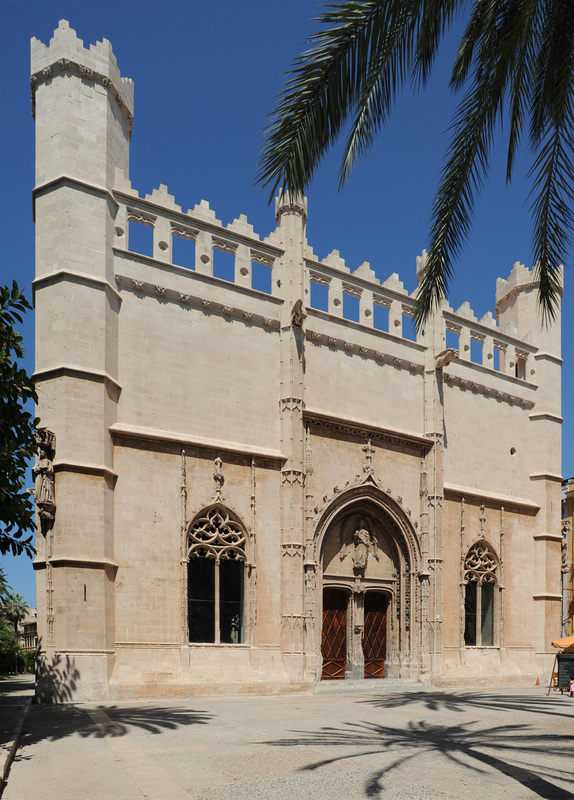 The Llotja dels Mercaders of Palma is one of the masterpieces of Gothic civil architecture of Mallorca and one of the largest in Europe, reflecting the commercial wealth of the city in the fifteenth century. The building is rectangular 40 by 30 meters, flanked by four octagonal corner towers. Each corner tower is decorated with the statue of one of the four Evangelists saints towers contain a spiral staircase to climb to the terrace. The terrace is surrounded by an openwork gallery that crowns the building, simulating a walkway punctuated ten turrets and battlements gargoyle, concealing essential buttresses of the arch. The severity of each of the four walls is softened by two remarkable large Gothic windows, the fine tracery of stone. The main facade is present in a stressed plant ornaments archivolts to entry; its tympanum is decorated with a sculpture of the "Angel of the Trade" (Angel de la Mercadería). 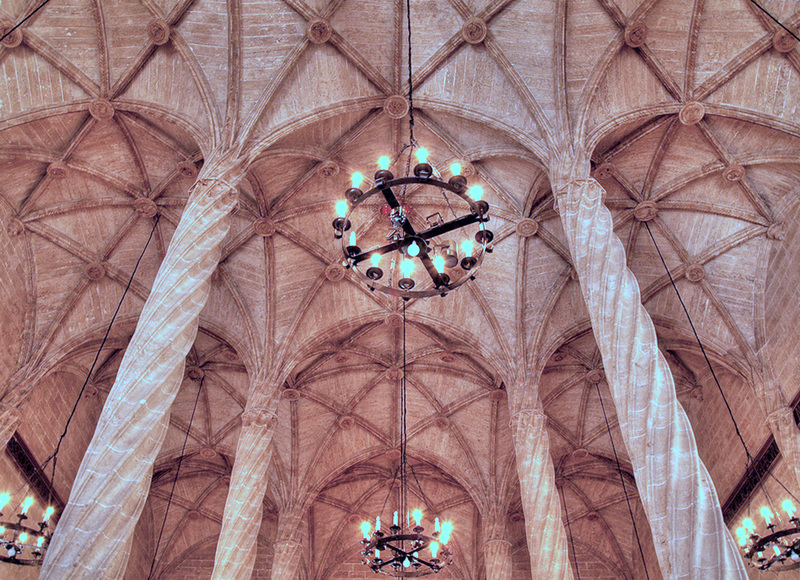 Inside, the room is a splendid trading vaulted; unique vault has diagonal ribs decorated ribs falling on six beautiful twisted columns. These columns without capitals are like palm trees, giving the whole picture of a palm stone of great elegance. 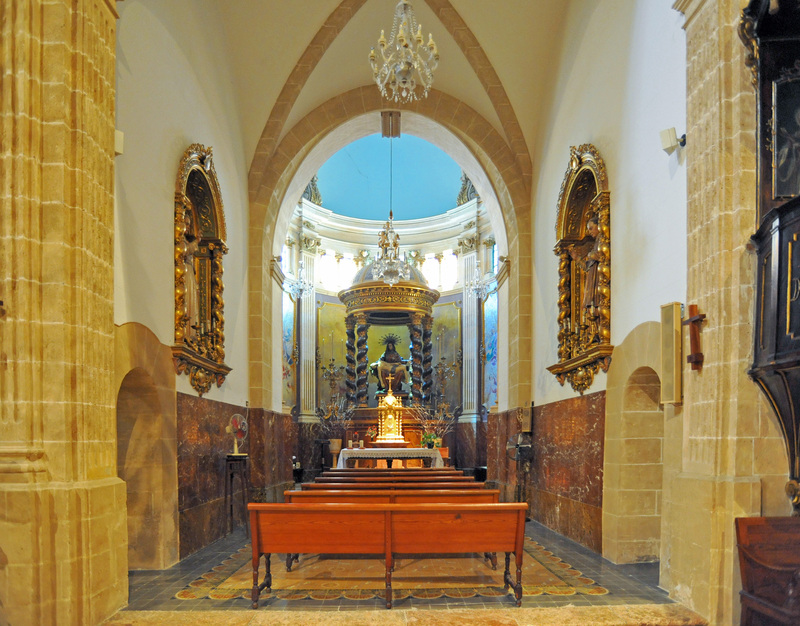 Nerves arches are built directly on the walls, as in the chapter of the cathedral of Palma de Mallorca. After its completion in 1452 until its dissolution in 1830, Sa Llotja was the seat of the Bourse du Commerce Maritime de Palma privilege granted in 1403 by King Martí I. 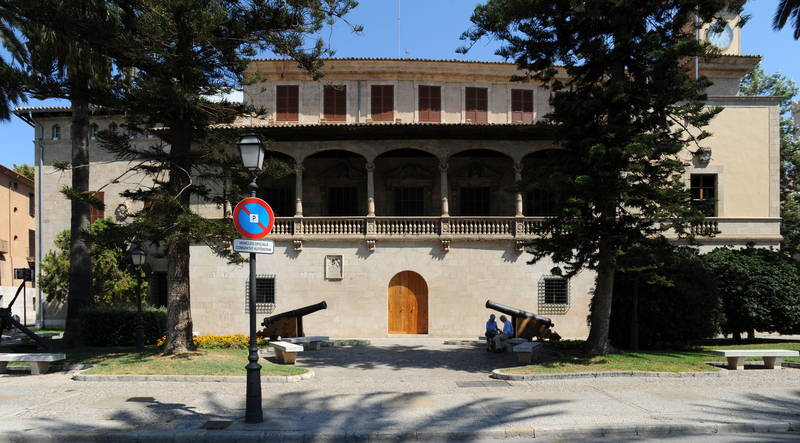 This institution was responsible for the regulation and trade protection, and maintenance of the port city of Palma. This is the place that had business transactions. 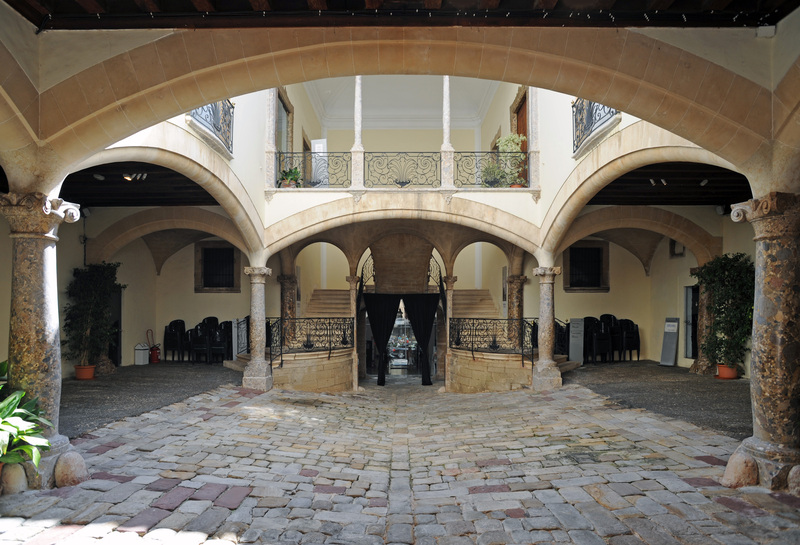 After the decline of maritime trade, Sa Llotja has been used for some time as a single warehouse and goods as the courthouse. Between 1886 and 1962, it housed a museum of art and archeology. Sa Llotja now is space for temporary exhibitions every month which works of art of all styles and trends are presented. Visit: the inner room that is open to the public when there are temporary exhibitions. Address: Plaça de Sa Llotja, 5. The Lodge is located south of the city of Palma seafront on Passeig Sagrera, not far from the cathedral. 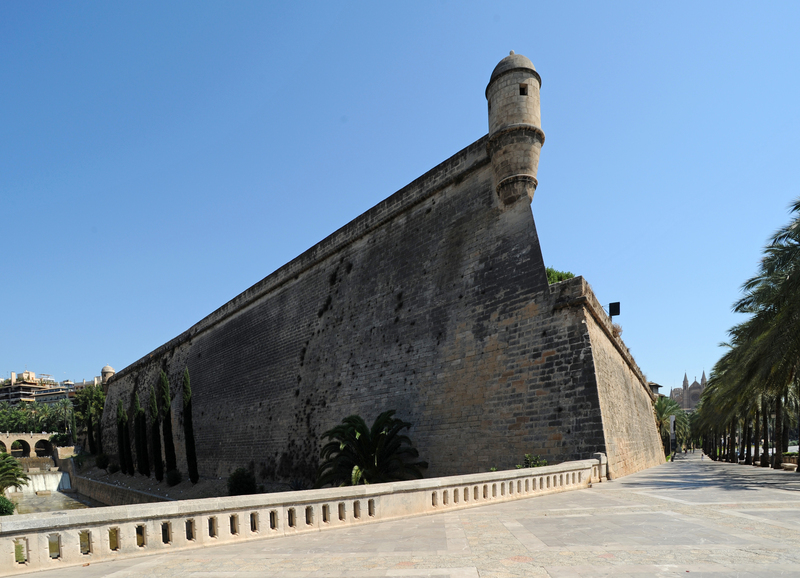 The south facade was once part of the city wall to the sea, where she is now separated. Hours (during exhibitions only): Tuesday to Saturday from 11:00 to 14:00 and from 17:00 to 21:00. Public holidays and Sunday morning from 11:00 to 13:30. Closed on Mondays. 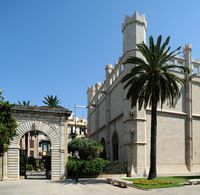 Consulate of the Sea is a Renaissance building built in the early seventeenth century style and is decorated with a remarkable Renaissance gallery overlooking the seafront is separated from Sa Llotja a garden where there is a chapel of Late Gothic style, built in 1600 for members of Sa Llotja. Consulate of the Sea, founded in 1326, was the seat of the court of maritime trade. 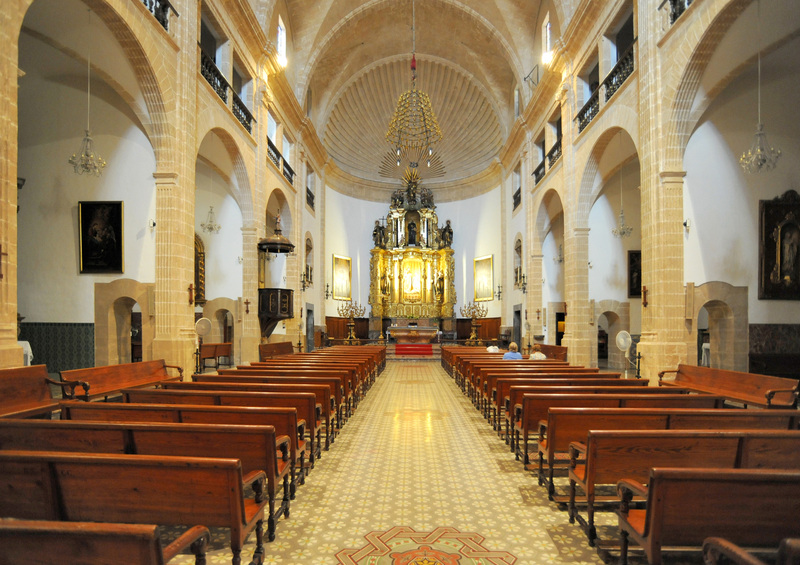 The Presidency of the Autonomous Community of the Balearic Islands is now installed and for this reason, the building can be visited more. 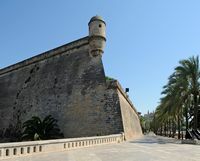 The Bastion St. Peter, commonly called Es Baluard (Bastion), located near the Porte St. Catherine, is a fortification of the ancient wall Palma Renaissance. 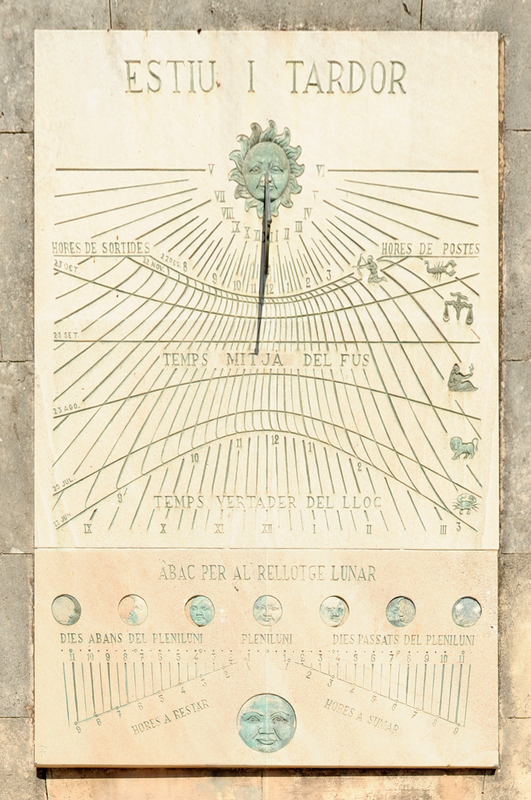 There is a set of sundials. The bastion terrace offers a beautiful view of the harbor and around Palma. 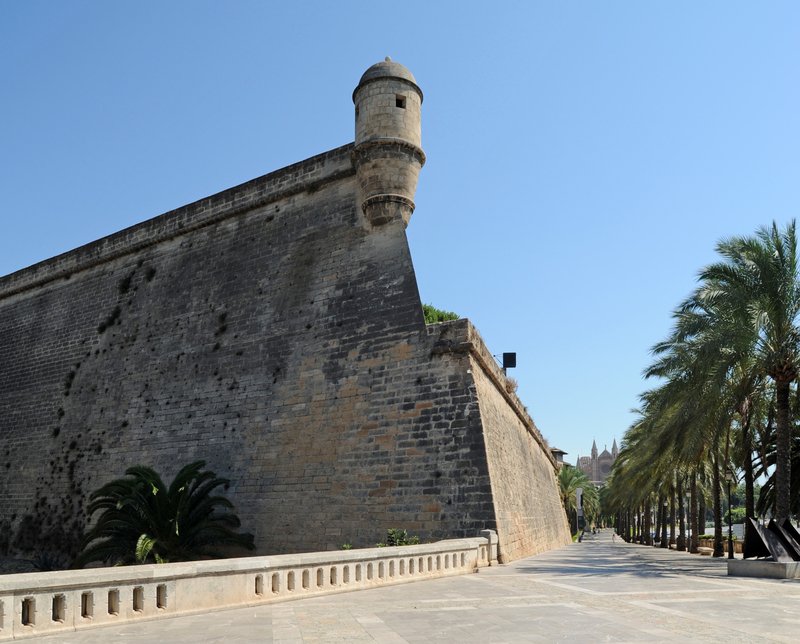 The Modern and Contemporary Art Museum is also known as the Bastion (Es Baluard) because it is housed in the former bastion Es Baluard. 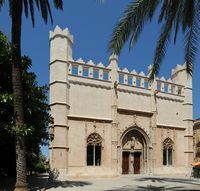 The Museum of Modern and Contemporary Art of Palma - opened in 2004 - aims to promote the art of the twentieth century to the present in relation to the Balearics. It includes works by Joaquim Mir, Joaquin Sorolla, Joan Miró and Antoní Gelabert. The collection is complemented by paintings of Juan Gris, Pablo Picasso, Rene Magritte, Francis Picabia et cetera. Hours: Open every day, except Mondays, summer (June 16 to September 30), from 10:00 to 21:00 and in winter (October 1 to June 15) from 10:00 to 20:00. Closed 25 and 26 December and 1 January. 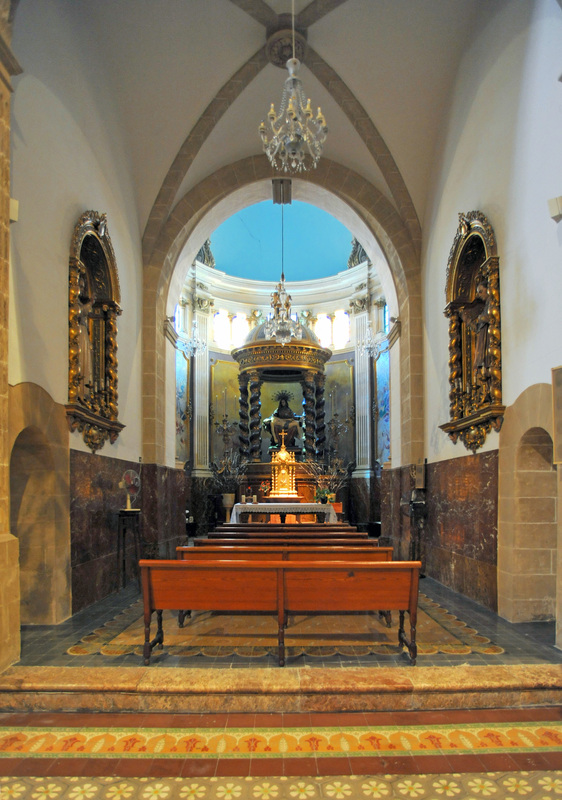 The Chapel of St. John is located in the district of Sa Llotja sailors. 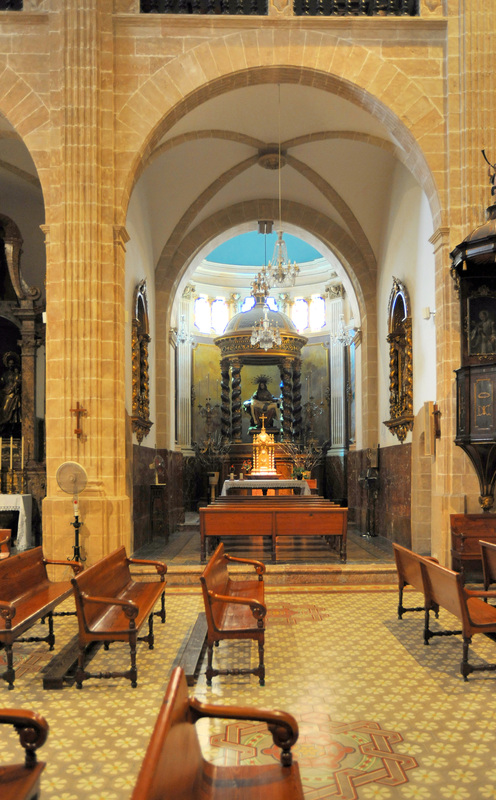 The Holy Cross Church is a Gothic church whose construction began in 1335 near what was then the Porte St. Catherine. 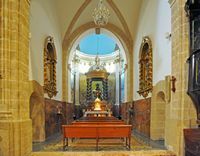 The church was built on the site of an earlier church whose only remaining pre-Gothic crypt of St. Lawrence. The Holy Cross Church is today a fairly decrepit parish church, it has a small museum of sacred art. The main door (at No. 7 Carrer de Santa Creu) is a baroque addition. 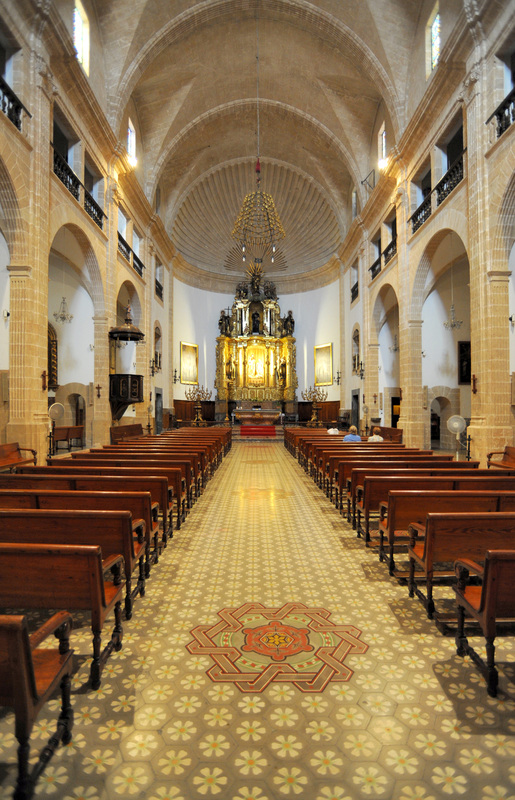 The St. Catherine is located west of the new course of the river Palma, beyond the door St. Catherine and St. Peter bastion. This is traditionally the fishing district, known for its market, the Mercat de Santa Catalina, where you can buy typical products of the Majorcan countryside. "Elegant proportions and original character do not exclude perfect regularity or simplicity full of taste." There is an office of the tourist office in the Casal Solleric.